It arrived on Thursday. The Fat Quarter Shop Designer Mystery BOM, block number 6. I've said it before, and I'll say it again. 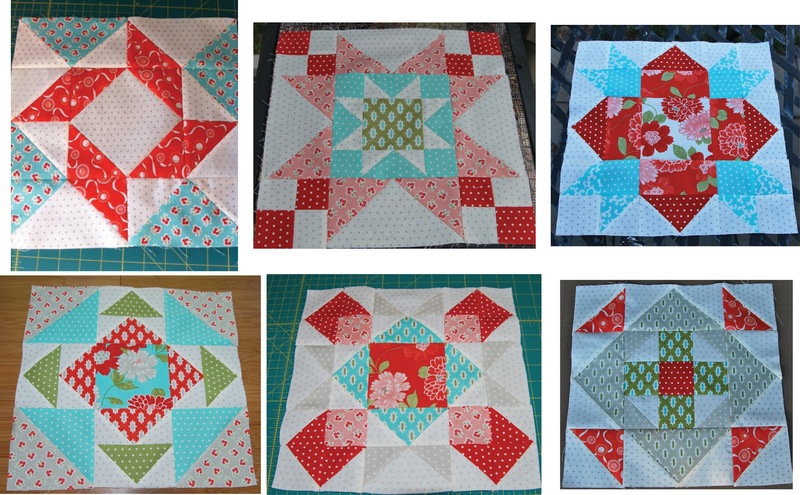 There is something about these blocks that makes me HAVE to cut it out and sew it up within a few days. I actually finished the block yesterday but didn't have time to take my bad photo and post it. This block is called "Town Square" and is designed by Kate Spain. It's the third block where you have to cut one of the fabrics two different ways to make the block come out correctly. I'm seeing blocks quite differently now that I know about this. Because this is block 6 of 12, I thought I would put them together so far to get an idea of what the variety of blocks looks like. I think my favorite so far is block three. Which one is your favorite?